Dwayne Johnson, who has already been linked to a Big Trouble In Little China remake, has his sights on another '80s property. 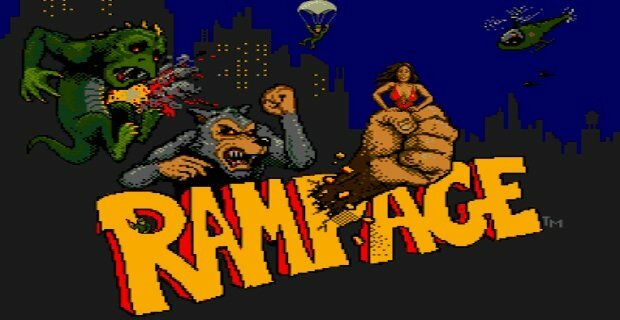 Deadline is reporting that the San Andreas star will be helping more U.S. cities, this time against large creatures in a live-action adaptation of the Midway arcade game Rampage. Johnson will be re-teaming with New Line Cinema and producer Beau Flynn (San Andreas, Journey 2, Hercules) for the new movie set to begin production in 2016. The director and other actors have yet to be announced. Johnson will join Rampage immediately following production on Fast & Furious 8. If you need a refresher on the arcade game, Rampage followed George the ape, Lizzie the lizard, and Ralph the wolf across the United States on a path of destruction. The large mutated monsters would attempt to level entire cities while being attacked by military soldiers and vehicles. Once the monsters lost their power, they transformed back into their original human form. You can also check out my memories of Rampage at the '80s arcade. I'm anxious to hear more about the film as Rampage was one of my favorite games. I'm curious if they will try to go large scale or let it be more of a homage to old disaster films. As a Godzilla fan, my interest is peaked!